With his staff and colleagues gathered around him as he stood on the counter to be heard, “On Tuesday, May 16, 2017, we did our first TEE (transesophageal echocardiography) procedure at Capital Cardiology Associates,” announced Dr. Jeffrey Uzzilia. “Today, Dr. (Kevin) Woods performed our 1,000th test!” The room applauded the success of the TEE Cardioversion Suite at Capital Cardiology, the first of its kind in New York State. A TEE is a non-surgical outpatient procedure, where a small, flexible tube containing a probe is inserted into the esophagus to provide live images of the heart. The procedure usually takes about 30 minutes to complete. During the procedure, physicians, nurses and specialized staff observe your heart’s structure and function. Special attention is placed on the upper and lower chambers of the heart, the heart valves, and blood flow. After a stroke, this procedure is used to look for blood clots in the chambers of your heart as well as the examination of the heart after recent surgery. Internally, the staff at CCA worked to convert a part of the building at Corporate Woods to a suite where the TEE procedure could be performed. 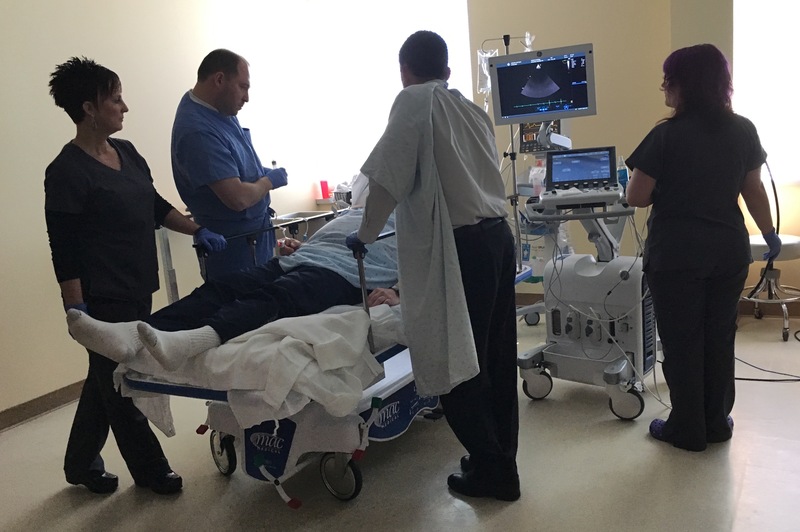 “It took a lot of work from our team, from our check-in team working with patients arriving for the procedure to our Echo (echocardiography) staff learning new processes to figuring out how to modify and manage the patient flow in the room,” said Dr. Uzzilia. This included remodeling but also required obtaining the latest technology, put in the hands of a staff that specializes in this level of care and advanced medicine. A board-certified cardiologist performs the procedure with a team trained at this an exceptional level of cardiac medicine. Additionally, there is a board-certified cardiac anesthesiologist present for all TEE scans. After a few months of converting the floorplan, training the team, and acquiring the technology, the TEE Cardioversion Suite at Capital Cardiology Associates opened for its first patient appointment on May 16, 2017. I had the honor of attending that groundbreaking procedure; you would have thought they had been performing this test for years. Since then, the physicians and their team at CCA have been performing TEE’s on Tuesdays. Reaching 1,000 of anything is quite an accomplishment. As Dr. Uzzilia announced hitting that number, I thought of two recent milestones mentioned in the neighboring days. One came a few days earlier, Sunday, January 20th, during the AFC Championship game between the New England Patriots and Kansas City Chiefs. As the Patriots were securing their advance to a record 11th Super Bowl appearance, the fact was stated that in his 24 years as the Head Coach of the Cleveland Browns and New England Patriots, Bill Belichick has coached in 384 professional football games. In his 44 years of coaching in professional football, starting as a Staff Assistant for the then Baltimore Colts in 1975, Coach Belichick still hasn’t hit 1,000 games. He’s only coached in 690. NBC has been promoting the 1,000th episode milestone of “The Tonight Show with Jimmy Fallon” which made its debut from Studio 6B in Rockefeller Center on Feb. 17, 2014. The Winter Olympics coverage ran longer than expected on NBC that night, forcing Fallon to start his show at midnight. On his first broadcast, Jimmy collected a $100 bill from his first guest, Robert De Niro, who had once bet Fallon $100 that he would never host The Tonight Show. On Wednesday, January 23, 2018, Jimmy Fallon celebrated his 1,000th Tonight Show episode. It took him almost five years to reach that mark.